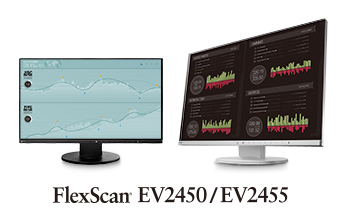 Hakusan, Japan, September 9, 2014 – EIZO Corporation (TSE: 6737) today announced the release of the FlexScan EV2455 and FlexScan EV2450 IPS monitors for business environments such as trading rooms, back offices, and control rooms. These monitors feature a new “Fusion” design that houses EIZO’s own EcoView technologies for reduced power consumption and improved visual ergonomics inside an extremely compact cabinet. This new housing features 1 mm ultra-slim bezels on the sides and top (with black borders of 5.2 mm for the FlexScan EV2455 and 4.3 mm for the FlexScan EV2450) and a depth of a mere 47.9 mm for both models. This makes for an attractive design that blends in with the desktop and reduces eye movement in a multi-monitor setup. EIZO backs the monitors with its industry-leading five-year warranty to reduce total cost of ownership and ensure a long service life. The FlexScan EV2455 has a 24.1" screen size and a native resolution of 1920 x 1200 while the FlexScan EV2450 has a 23.8" screen and a 1920 x 1080 native resolution. Both monitors use an LED-backlit IPS (in-plane switching) LCD panel with 178° viewing angle that minimizes color shift and contrast changes when viewing the screen at an angle. The typical brightness is 300 cd/m2 for the FlexScan EV2455 and 250 cd/m2 for the EV2450. The contrast ratio is 1000:1 for both monitors. The FlexScan EV2455 and FlexScan EV2450 come with four input terminals to meet the diverse requirements of businesses – DisplayPort, HDMI, DVI-D, and D-Sub mini 15-pin. Both models include an ergonomic stand with 140 mm height adjustment, 40° tilt (5° down, 35° up), and 344° swivel. They also pivot 90° clockwise and counter-clockwise so users can take advantage of their ultra-slim bezels even when using two monitors side-by-side in portrait mode. The brightness dimming methods of conventional LED-backlit monitors cause many people to see flicker which results in eye fatigue. EIZO uses a hybrid technology that makes flicker unperceivable even at low brightness levels. In a comparison test conducted by EIZO, the FlexScan EV2455 and EV2450 on average exhibited 74% less flicker than LED-backlit monitors from other manufacturers Furthermore, in dimly-lit work environments, brightness is adjustable to 1 cd/m2 which is less than 1% of the maximum. EIZO’s incorporates its own EcoView technologies to reduce typical power consumption to 13 watts for the EV2455 and 12 watts for the EV2450. EcoView Optimizer 2 saves power by reducing the backlight brightness and increasing the gain on screens consisting mostly of dark content. Auto EcoView automatically adjusts the screen’s brightness in accordance with changes in the ambient brightness to trim power usage while reducing eye fatigue. In addition, a presence sensor called EcoView Sense 2 detects when the user leaves the desk and automatically switches to power save mode. When the user returns, EcoView Sense 2 powers the monitor on again. It detects both the user’s movements and body heat for increased accuracy. Two EIZO-developed software programs* called ScreenManager Pro and EIZO Monitor Configuration simplify screen adjustment. ScreenManager Pro lets users adjust color and EcoView settings with the mouse and keyboard instead of the on-screen display menu. It also offers multi-monitor matching which allows adjustments to be applied to all FlexScan monitors connected to a single PC. EIZO Monitor Configurator lets system administrators control the settings of all FlexScan EV monitors with a USB connection. The settings of one monitor can be applied to other monitors. Dual 1-watt internal speaker and a headphone jack. The FlexScan EV2455 and EV2450 are now shipping. Date of availability varies by country so contact the EIZO subsidiary or distributor in your country for details. * ScreenManager Pro and EIZO Monitor Configurator are compatible with Microsoft Windows 8, 7 and Vista.